Sheepish me with yet another feature post for beginners! I think I am on the verge of exhausting all that I would like to tell to a new entrant into the baking world. And that for me is one minor victory! In the simplest recipes for beginners, I will in all probabilities be tempted to write a few of these at the beginning of each recipe. Thought will put it all together so that you won't need to read the same things over and over again. Some general tips, some preparation tips. Ideally that's how it will work best. Assuming you read up on the basics before you begin. STOCK UP ON ESSENTIALS: First most important thing. 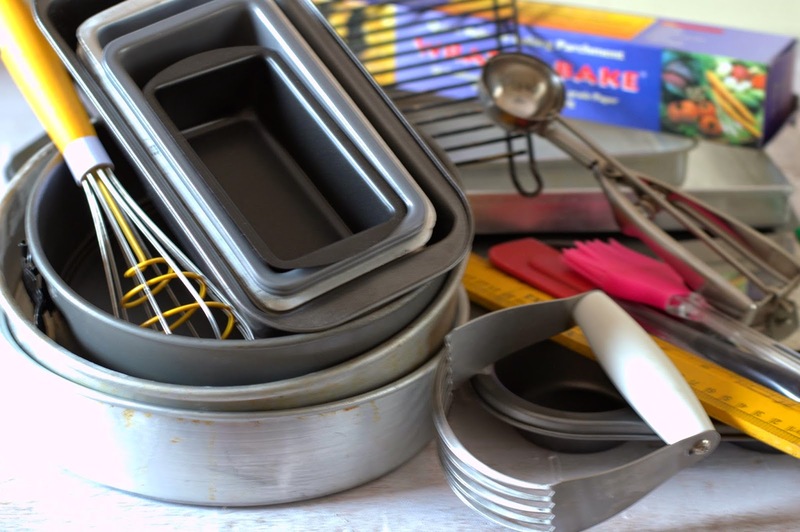 These essentials include a good convection microwave or an OTG, basic baking ingredients, gadgets and tools. Its really not enjoyable to begin with buying each ingredient and tool every time you want to try a new recipe. Start with basic stuff, build as you go. We can't hope to 'make do' without these basic things and still expect decent results. No, the old aluminum cooker tin may not be the best size, you can't 'give a shot' using that box of cocoa from last year as it will otherwise go waste. 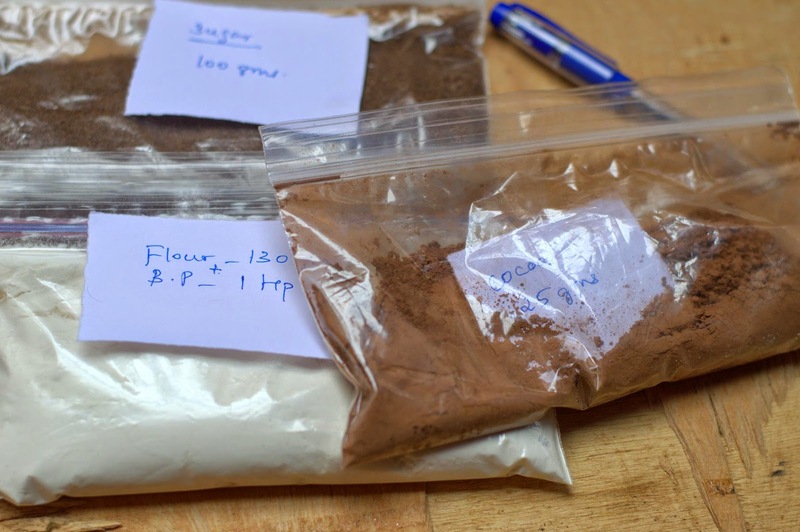 Remember, apart from wasting that cocoa, you may end up wasting other ingredients too. More important, your time, effort and the possible disappointment. FIGURE OUT WHAT YOU WANT TO BAKE : I have a dozen recipes swimming in my head every time I want to bake. Zero in on that one recipe you want to try today or tomorrow. This will help you gather ingredients in case you need to buy things like eggs, cream, fruit, whole milk etc. Having a recipe in mind and the ingredients for it at home is half the prep done. Chose simple, do-able recipes when you begin. Do read reviews of recipes where possible to see what others who have tried it have to say about it. PRINTOUTS : Take a printout of the recipe(s) you want to try. If halving a recipe, halve the ingredients and then print it. Make note of any conversions, including oven temperature. A baking chart is of great help here. Underline anything you need to quickly spot in the text. Like dimensions, consistency etc. Have a pen handy. 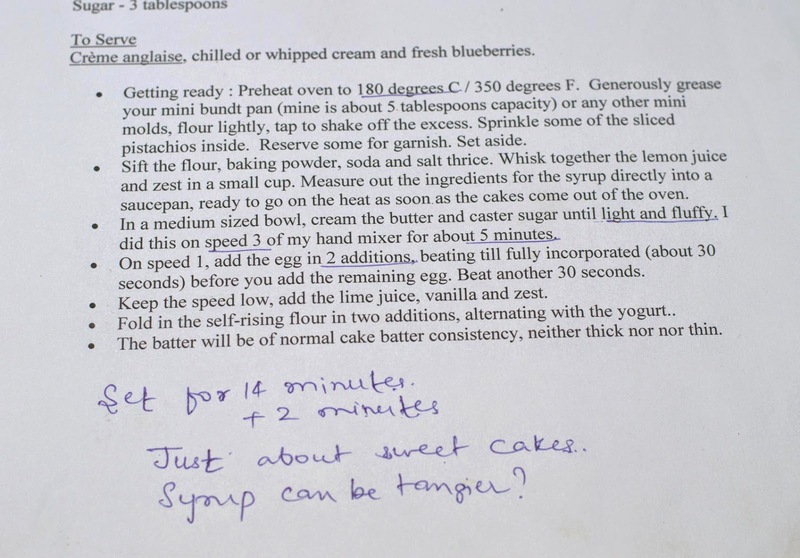 Its much easier to tick off ingredients you have already measured, take hasty notes. No hassle of navigating screens, locks or smudging your iPad screen with butter. Particularly useful with kids running around when you would have measured the flour and dumped the baking powder on it. One loud thud and two screams later you are not sure if it was the soda or baking powder or both that's sitting on the heap of flour. 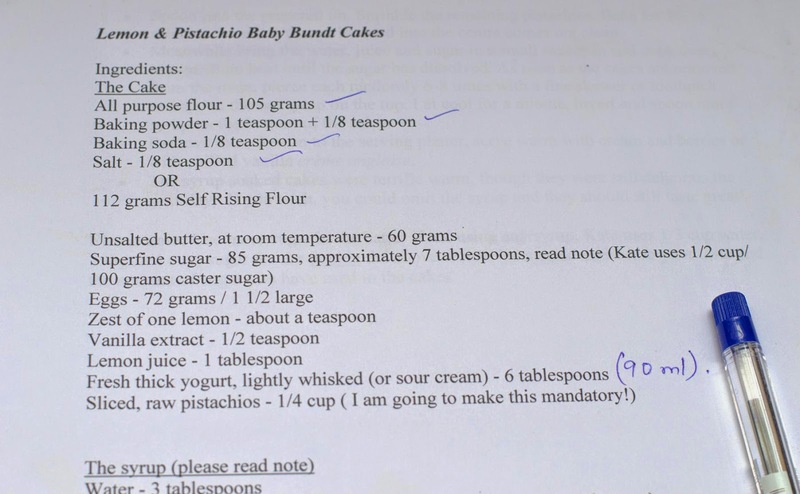 You can also make your notes about the baking time, proofing time for breads and any variations you want to try next time. READ RECIPE INSTRUCTIONS : Before you even begin baking preparations, read the recipe at least twice thoroughly, the notes, updates too if any. This will help you understand the procedure, make sure you have the pan you need, the tools, all ingredients you need. If in doubt about techniques, watch a video which demonstrates the technique, it really helps. In chocolate recipes which need cocoa, most likely the flour will be sifted with the cocoa. But in some recipes, the it may be mixed with hot water or warm butter for an intense cocoa taste. An 'oops' loud enough to scare the neighbors is still not going to help separate the flour and cocoa at the last minute. So do read recipes carefully. PREPARE YOUR PAN : Use a baking pan of the size recommended in the recipe. Prepare your pan and keep it ready before you proceed with the recipe. You could do it the previous night if that helps. More on lining pans here. PRE-HEAT OVEN: Pre-heat your oven ahead. Its better to keep your oven waiting rather than the batter. An oven thermometer of course helps to know if your oven has reached the desired temperature. Invest in one. WEIGHING INGREDIENTS: Weigh the dry ones first, then the sticky and wet ones. Butter first, eggs next and so on. If weighing egg whites, weigh them after the dry ingredients, before you weigh the yolks or butter. Drop them in squeaky clean bowls, using really clean spoons. Remember egg whites for whipping need to be totally free of grease. Or you will end up washing the weighing bowl once in between. Mise En Place: The French phrase for putting everything in place. Lining up your ingredients on your counter before you begin. Though its a little unlikely that someone will film us baking, it certainly helps carry on with the procedure (what a word!) without unnecessary interruption. INGREDIENTS : All ingredients at room temperature unless specified otherwise. Use good quality fresh ingredients for best results. I prefer weighing for ease and accuracy, better results. BUTTER : If your recipe needs butter at room temperature or very cold butter, you will need it to be just at the right temperature when you use it. For chilled butter, you can weigh, cube and refrigerate even a couple of days ahead. When you want your butter at room temperature, be careful before you take it out of the fridge especially in summer as it will turn too soft too soon. Have all other ingredients ready before you get the butter out. Better to wait for a few minutes for the butter to soften and then use rather than having butter too soft. In case your butter gets too soft, pop it in the fridge for a couple of minutes till it feels right. Use immediately. EGGS : Use fresh eggs. Whisk the eggs, weigh and then use. Simple brownie recipes, easy chocolate mousse fillings involve mixing in eggs into the chocolate butter mixture. Even if you think a few grams here and there will not make a great deal of difference to the end product, crack the eggs into a bowl and then into the batter. Imagine - all that effort and chocolate going to the trash can because of one bad egg. We all learn the hard way! When we are talking about eggs, avoid adding an extra egg or skipping the yolks in an attempt to get a lighter texture. It may not always work unless this variation is specifically suggested in the recipe. If the recipe calls for cold eggs, you would need to put them in the refrigerator a couple of hours perhaps. If the eggs are cold just out of the fridge and you need them at room temperature, then keep them out for an hour or so. Or put them in warm water (not hot) for some time. INSTANT COFFEE : This gives a better, more intense flavor when dissolved in hot liquid. If the recipe has milk or water as one of the ingredients, it should be fine to heat a tablespoon of the liquid, dissolve the coffee. Cool, mix with the rest of the liquid and use as specified. Coffee works great in chocolate recipes as it heightens the chocolate flavor. EGG WHITES: If the whites are meant to be simply whisked into the batter , you don't have to be paranoid about washing the bowl and spoon 5 times. In recipes where you need to whip egg whites, its always better to have all the ingredients and pan ready, oven heated. First whip the egg whites and keep aside. You can then use your mixer blades to beat the eggs or creaming the butter without having to stop mid way to wash the beaters thoroughly and dry them. Unless of course you have an extra set of blades you could use. 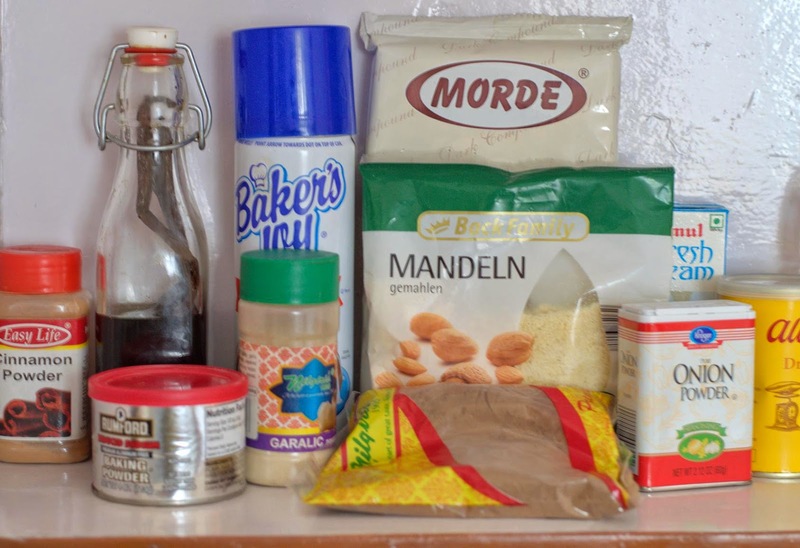 DRY INGREDIENTS : I like to always sift dry ingredients like flour, baking powder, soda, salt and spices like cinnamon, cloves etc. Sifting aerates the mixture and also helps even distribution of salt and leaveners. STICK TO THE RECIPE LIKE SUPER-GLUE : Do not try to make substitutions and changes to the recipe or procedure. If you want to bake an egg less cake better to follow a recipe for egg less cake rather than trying to use a substitute for eggs in another recipe. It may or may not work. Don't even think of beating / whipping the batter 'really well' or adding a 'bit more' of baking powder for a lighter cake. It may turn out to be disastrous. PREPARING WELL AHEAD : Toasting and chopping nuts, shredding dry coconut, chopping dark chocolate, powdering sugar, cutting out liners for your pans. These can be staples ready to use. Weigh dry ingredients needed for the recipe ahead, store in zip-lock pouches with labels. All of these pouches can go in another large pouch with a label thrown in of course. Now you won't procrastinate so much, it won't take you so long to bake that cake whenever you can spare the time. I do this when I need to start early and finish baking early. BE CONFIDENT, NEVER CARELESS : Even if you have made the same recipe a few times successfully, you still have to be careful every time you bake it (Don't remind about over-confidence and failed bakes please!) Unless you are Nigella Lawson, throwing things together carelessly may not give you the same results the next time! THE FLIP SIDE OF BAKING: Baking is more often than not, sugar, fat and refined carbs. Its takes little time for baking to go from hobby to obsession. Not-quite-there bakes are something, but please do not force yourself or your family to eat things which are ' just edible'. Save those calories for something eminently edible. Down the line, halve or quarter large recipes to see if its to your liking before baking large batches. Share some or freeze extra for later use. Space out sweet, savory and healthy bakes. When you want to desperately bake something try a new granola recipe or crackers or some biscotti. These are relatively low in calories and fat and can be eaten over the next one or two weeks. Nice post Suma. I have been watching this space for sometime for baking related posts. Wonderful job! All are your baking pans which showed in the picture? Your blog has helped me a lot at the initial stages of my baking adventure. Thank you for your wonderful posts.